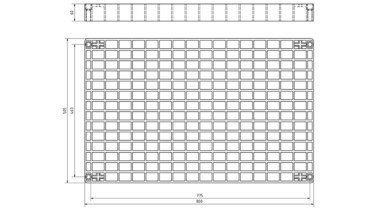 The gratings are used for all applications with aggressive media that may cause corrosion and, due to the excellent chemical resistance of the material, the are suitable to applications that normally require gratings made of stainless steel. Easy assembly and cutting with commercial tools. Material: Polymer on PP-base, reinforced with chemically bonded fiberglass, in dark grey. Other colors and versions are available on demand, acc. to fire classification UL 94 V0.